These are works done for the Betty Brinn Children's Museum. My responsibility was mostly software developer and electrical engineer with some amount of fabrication work done for exhibit interiors. Some exhibits travel while others are semi permenant fixtures at the museum. Some exhibits have since been retired or altered to no longer contain some features that may be shown here but at one point all exhibits were produced and exhibited for patrons. Word Headquarters is an exhibit based around literacy imagined to be a kid friendly factory of words. Children can role play as employees who are discovering the building blocks of literacy and creating sentences, stories, songs and other forms of self expression. My contributions included a recording station where people could record themselves and then watch the playback of their actions, a blog stations that allowed kids to create a valid webpage blog with headings, images, and text, as well as the central exhibit the Chip Kidd design center. The design center was envisioned as a kids version of an image layout editor with multiple layers for text and images. The text and images could have effects given to each, scaled, repeated, and so on. This is one of the three interactive components of Velocity. Using a Microsoft Kinect it tracks the balls flight path and draws it onto the back wall. Meanwhile the monitor displays how far the ball flew to the nearest centimeter. The monitor on the back of the loop displays the fastest recorded speed of the ball as it went around the loop. The final of the three interactive components of Velocity, the balls path around the dish is tracked and drawn in real time as the ball circles around. The monitor on the back of the exhibit displays how long the ball took to go around the loop from its initial recording till it falls into the hole at the bottom. Velocity was one of the more ambitious camera vision exhibits I produced with two of the three utilizing the Microsoft Kinect sensor and the other a standard webcam. Techniques included background subtraction and entity tracking over time. The Jump and the Loop, which each use a Kinect had the benefit of a small distance frame to allow for tracking the golf balls but also had the problem of semi obscured vision cones interesting data visualization requirements. The loop displays the most information with the travel of the golf ball along with its speed. The Dish uses a standard webcam and masking to attempt to track the golf ball and is decently accurate even with multiple balls rolling at once. Each version has a display on the back that details information from each such as the distance traveled, distance jumped, and the total speed graphed per attempt. An interactive exhibit at the Betty Brinn Children’s Museum that is part of its Ecology Center. 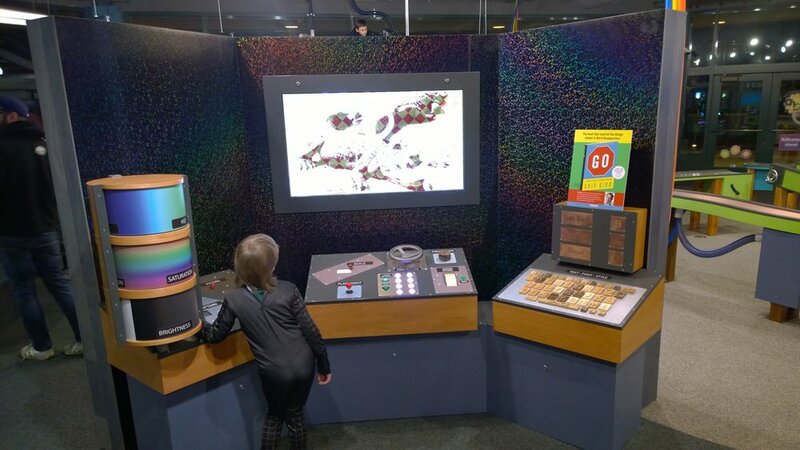 Using a multi-touch TV screen, kids can interact with ants that contain a simple artificial intelligence. Actions such as drawing tunnels for them to follow will allow the ants to explore their environment more and find food that has been left on the surface. 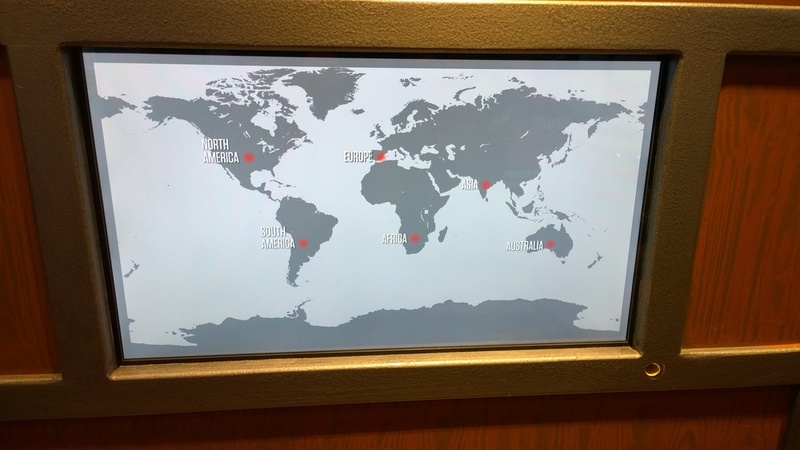 An interactive touch screen program with tours around the world and facts about the locations along the way. The cop bike installed at the the Washington Pavilion in Sioux Falls, SD. Hands on Harley was a chance to work with a Milwaukee icon, the Harley Davidson Company. 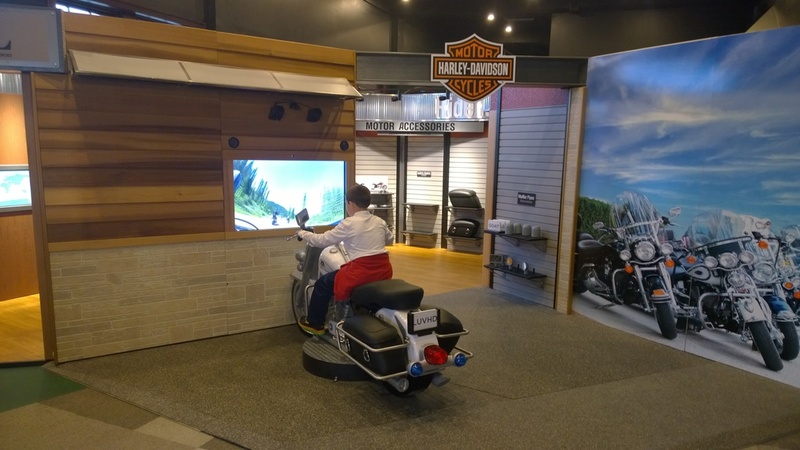 This exhibit features 2 interactive bikes that allow patrons to switch between riding videos that are controlled by the bikes throttle. Other components of the bikes handle bars are also handled such as the horn and toggle switches which play various informative animations in the lower corner of the screen. Once a throttle is revved nearly to the max a series of fans kick on to give you the feel of wind in your hair. There is also an interactive touch screen map that gives people more information about the rides shown in the videos. The exhibit is a permanent fixture at the Betty Brinn and also has a traveling component around the US. Maestro has since been retired but it was the first piece in the museum to feature a Microsoft Kinect. The concept was simple, wave your arms back and forth to conduct your orchestra. 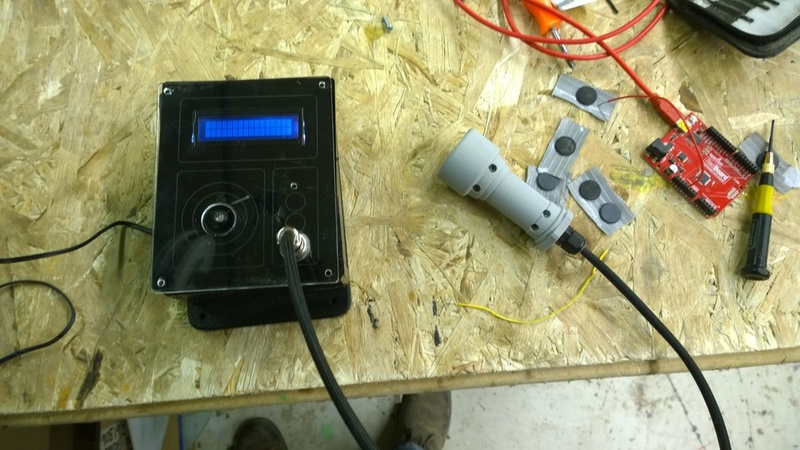 The original exhibit had an IR light wand that the kids would have to point at an IR sensor above the screen, unfortunately this kept breaking and was redesigned in house to utilize the, at the time, brand new Kinect sensor. Thanks in large part to the work of the open Kinect group which made it all possible the original redesign was a bit buggy since the drivers and API were not stable. Once the public SDK was released, it was redesigned once again to utilize the Kinect SDK. The green screen setup for the BBTV exhibit at the Betty Brinn Children's Museum. It utilizes MaxMSP to key out the background with interchangeable images and movies. The green screen and cameras with video monitors. From the perspective of the green screen, how the studio looks including costumes on the back wall and video monitors so that you can see yourself reporting. Housing a webcam and some video monitors the kids can pretend to be the one controlling the camera, though it can pivot and tilt. BBTV is a permanent fixture in the Betty Brinn Museum that allows children the chance to role play as a news reporter. A normal webcam is affixed into a rotating TV camera housing. The control desk allows other kids to change the background from a series of backdrops which can be still images or videos. 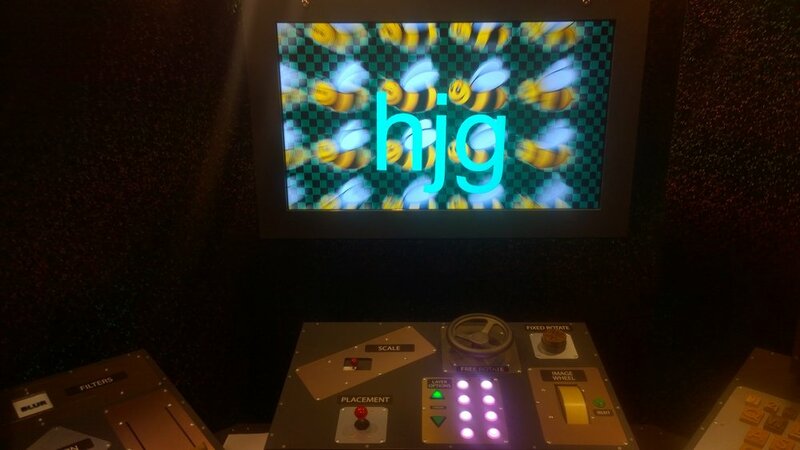 They can also apply video effects such as changing saturation levels to the captured image which is displayed on several screens around the exhibit. The exhibit does not record any footage but allows children to pretend as if they are on live television as the delay is so minimal it is almost unnoticeable. This exhibit at the Betty Brinn Children’s Museum uses an Arduino to read RFID tags embedded in parts of the exhibit. When they are scanned message are displayed on the LCD screen attached to hood of the car. The super service center is a long-time fixture in Betty Brinn and also one of the purchasable exhibits by other museums. Because of this, it has undergone redesigns multiple times and new features are added and removed from the Brinn’s floor as they are tested on the children that make their way through the museum. One of the new features tested was a diagnostic tool using RFID tags that would tell kids if a part needed replacing when it was scanned with the attached wand. Current models no longer have this feature as it was prone to breaking from the abuse it would experience on the floor.